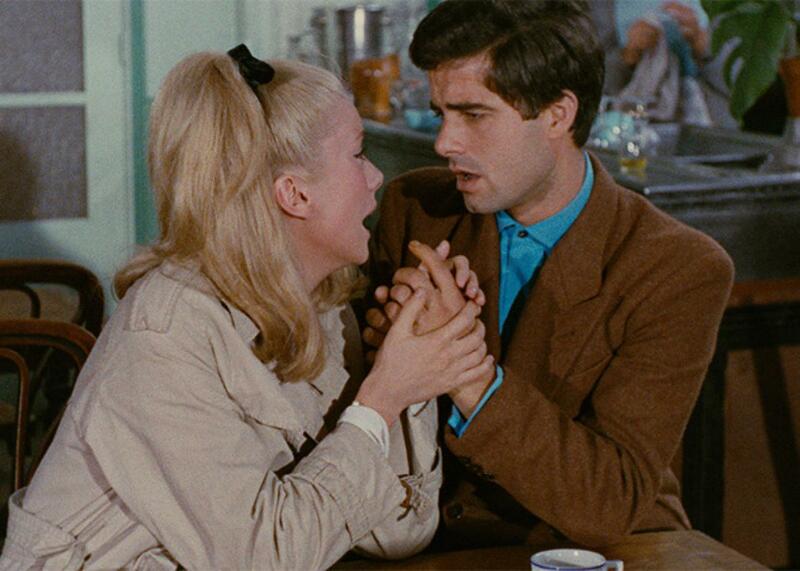 Jacques Demy's Umbrellas of Cherbourg and Young Girls of Rochefort were major influences on La La Land (VIDEO). Catherine Deneuve and Nino Castelnuovo in The Umbrellas of Cherbourg. La La Land’s Damien Chazelle has made no secret of his love for French movie musicals, especially the movies of Jacques Demy. Chazelle’s Harvard thesis film, Guy and Madeline on a Park Bench, draws heavily on Demy’s technique of placing musical numbers in naturalistic settings and integrating plot points that aren’t usually the stuff of musical theater. I don’t know of another musical that centers, like Demy’s A Room in Town, on a shipworkers’ strike. La La Land explicitly and implicitly homages Demy’s films: A storefront on the studio lot nods to his Umbrellas of Cherbourg, and the opening dance on the Los Angeles freeway looks an awful lot like the first scene of Demy’s The Young Girls of Rochefort. The Criterion Collection released both Umbrellas and Young Girls on Blu-ray as part of a Demy box set a few years ago, but today they’re for sale as standalone discs as well, and they’re both for rental on iTunes and other digital platforms, the former for a piddling 99 cents. (You can also view both, along with five other Demy features and The World of Jacques Demy, the excellent career-spanning documentary by his widow, Agnès Varda, via Criterion’s subscription service, FilmStruck.) Watching them in the wake of La La Land’s startling success—it’s taken in $436 million at the box office worldwide, and its soundtrack is the best-selling LP of 2017—is enough to make you hope there’s a new audience for Demy’s movies, just waiting to be tapped. There’s just one catch: After watching The Umbrellas of Cherbourg and The Young Girls of Rochefort, La La Land looks just a little thin by comparison. The moment when the ferry pulls away from the camera in the opening of The Young Girls isn’t forcibly more cinematic than Chazelle and cinematographer Linus Sandgren’s meticulously orchestrated (and Oscar-mandating) long takes, but it comes out of the environment rather than being imposed upon it, transforming the way we see the world rather than manufacturing a new one. Demy loved to find magic in the mundane, even banal: Rather than a flashy dance number, he opens Umbrellas with idle chatter between auto mechanics—“You going to the game tonight? Can you cover my shift?”—that would be run-of-the-mill were it not set to Michel Legrand’s music. And speaking of music, Slate has dragged composer Justin Hurwitz’s lackluster pastiche before, but put up against Legrand’s masterful command of melody and shading, it sounds even worse. Chazelle’s dedication to his old classmate is laudable, but Best Original Song Oscar or no, it’s time to drop that zero. The Varda-supervised restorations of Demy’s movies bring out their delicate pastel palettes, which naturally shine through in Criterion’s immaculate transfers. Physical media gets you a host of extras, including Varda’s 25th-anniversary documentary on The Young Girls of Rochefort, a 1966 TV interview with Demy and Legrand, and, on Umbrellas, an essay by the late, great Jim Ridley.